Anyone who has ever watched SS Rajamouli's magnum opus, Baahubali, starring Prabhas, Rana Daggubati and Tamannaah, has been dying to know the answer to this question that has spawned hundreds of memes. Baahubali's next part, that may or may not have the answer, is about to hit the screens soon. In the meantime, what one can do is read up a little about the beginning of it all, and that lesson starts with author Anand Neelakantan's new book The Rise of Sivagami. You probably remember Sivagami sacrificing her life to save Baahubali. That strong arm keeping the hero safe from the waves was one of the most striking posters for the movie, really capturing people's imagination. Author of Asura: Tale of the Vanquished, Ajaya: Roll of the Dice, and Ajaya: Rise of Kali, Neelakantan has taken on the herculean task of telling you how it all began. All of Neelakantan's older books have been written to tell the tale of the 'villains'. While Asura is Ravana's story, Ajaya (both the books) is the story of the Kauravas. Jhinuk Sen (JS): When did you start writing? 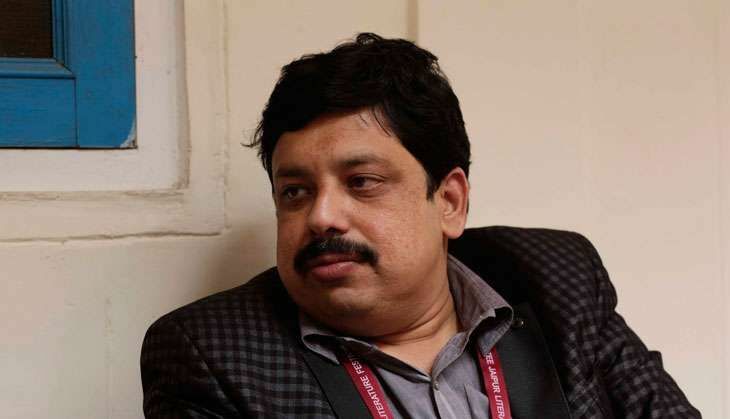 Anand Neelakantan (AN): I used to write right from college, and I used to publish it in local magazines. But that was in my native language Malayalam. So this was always there. Then, once I got married, settled down and all, I started writing Asura. At the age of 32 I decided I should write in English. I wanted to go beyond the three crore people who can read and understand Malayalam. English is not a very natural language for me, I write better in Malayalam - but I had to write in English so that it would reach everywhere. It was a conscious decision to write in English. It (Asura) took six years - at the age of 32 I started, now I am 43. When I was 36-37 it got published. JS: So when you are writing do you think in Malayalam but write in English? AN: Initially that's how it was, but now I have trained myself to think in English itself. JS: Six years for a book! Was it all the research that took so long? AN: Yes. A lot of research. And you don't have a deadline when you are writing your first book, you write when you want - no one knows you are writing the book! JS: How did you start with Asura? AN: When I started Asura there was no trend of mythology, if you ask me, I might be one of the few writers who started this trend. Maybe before that there was Amish (Tripathi), we almost published our books together, mine came maybe six months after his (Immortals of Meluha). And before that, there was Ashok Banker. Before that, there were not many big books written by Indian authors. There were NRI authors like Chitra Banerjee Divakaruni who were sitting in the US and writing. But local Indian authors writing in a big commercial way - this was not there before. So I didn't start this (Asura) thinking that it is a commercially viable thing. When I started writing, Chetan Bhagat's books were trending, they were the highest-selling books. So naturally, when I said I am going to write about Ravan, even my wife had her doubts. People were reading college stories and love stories. But I wanted to write about what I know! Whether it gets published or not - I just want to write for myself and I wrote it. Then I was fortunate enough that it became a hit. The book came and the trend also started. AN: It's time to get out of it...I am moving out of it. This (The Rise of Sivagami) is not mythology. JS: SS Rajamouli (director of Baahubali) had read your book and had asked you to come in. Initially, you were writing for yourself, about things that you know. How difficult was it to start focusing on an entirely different world & making it up? Fortunately for me, I've worked in TV a lot. I did three-four serials, so I was used to writing for the screen. JS: What's the difference when you are writing a series for TV and movies? AN: Movies are different, novels are different and series are totally different. There are two kinds of novels. I am not talking about the literary-commercial divide, which is a very vague divide, nobody can say what it literary and what is commercial. But there is a divide - there are writers who write with beautiful language and there are writers who write with beautiful visuals, whose language might not be great. I am a visual writer. It suits me. That's one of the reasons why I have been called by TV producers. Good literary writers will win accolades and awards, but my writing is visual - and this is the actual two divisions. JS: The Rise of Sivagami is 'The Beginning', this is even before Baahubali happened. What sort of research did you do to create this? AN: Lots of research usually goes into my book, especially since I was dealing with mythology - be it for TV or my three novels - three-five years of research goes in. Because I write about very controversial topics - if I slip a bit, it will all go down. So I had to keep all my references ready. But here the challenge was different. Here I only had 90 days. In 90 days I had to produce a book which was as big as my Asura or Ajaya - almost 500 pages. That's about 1,50,000 words - every day about 2,000 words that you have to write without fail. And not just writing, you have to plot, think of characters and all that. So that was a big challenge. But research-wise, this (The Rise of Sivagami) is approximately set in the 9th-10th century. I had to be careful about what I am writing - whether these things were historically available at that time. I cannot write about naval warfare, you cannot suddenly say that he took a telescope, because a telescope wasn't invented at that time...all those things had to be taken care of. Even certain folktales, if a character is talking about a tale in the background, that folktale I had to be careful about. That folktale's origin cannot be the 16th or 17th century...I had to write with all those details in mind. JS: You were writing almost 2,000 words every day - are you a very disciplined writer? AN: I would have written almost three lakh words, and then cut it down to half. I am disciplined writer in the sense that I don't have a discipline in what I write, schedule-wise I am disciplined. I wake up at 4 in the morning. JS: The Rise of Sivagami is the first book, then there will be two more books where the story continues. Then Baahubali the movie, we know there's a second part coming...we don't know about the third yet. How are you connecting Sivagami's story to the little of her that we have seen in the movie? AN: I had to 'back-work' the entire thing. Sivagami's character is defined (in the movie), she is there in certain scenes. I watch it again and again to know what her character is. Then how she reached that 'character' - everyone's character changes from youth to the point you come across them. So you should have a starting point, the end point you know. You can't 'rework' it unless there is a sudden contrast - so you start from there and work on that. JS: Were there certain characters in your head, or influences, when you were back-tracking on Sivagami? AN: Human nature is the same whether it is mythology or history. Nature doesn't change, only the system and the society changes. System and society is already set in the film, human nature - we know, you just have to plot it and you know that Sivagami is this particular character. Naturally, the character will take you where you want to go. Sivagami is modelled on so many strong women - from Jhansi ki Rani to Indira Gandhi to Sirimavo Bandaranaike.